Teaching: To stand for the historic, fundamental, Christian truths and to equip the saints for the work of service, for the building up of the body of Christ; with the goal of attaining unity, knowledge of the Son of God, and the maturity that is measured by fullness of Christ. Fellowship: To provide for means of developing meaningful fellowship among believers (expression of caring for and loving one another, warning, stimulating, and encouraging to healthy spiritual lives). Outreach: To participate in world evangelism (both in the local community and around the world) and to encourage and train God’s people to have an effective influence and loving ministry in the society in which they find themselves. Worship and Prayer: To provide for meaningful worship and prayer, and to administer the ordinances of baptism and communion. The world is being bombarded today with many humanistic (man-centered) philosophies that do nothing to help solve the problems and frustrations we are facing. 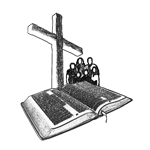 It is the firm conviction of Fellowship Bible Church that the Bible gives lasting solutions to today’s problems.